If language development is delayed or hindered due to other motor delays such as apraxia, then problem-solving is the best indicator of intelligence. I have clung to that statement because I know that Noah’s language will be delayed; so I look for his ability to problem-solve every day. Actions speak louder than words, literally. There are various aspects of development and one of those is cognitive development which includes problem-solving as well as language. Problem-solving is the manipulation of objects to achieve a specific goal. 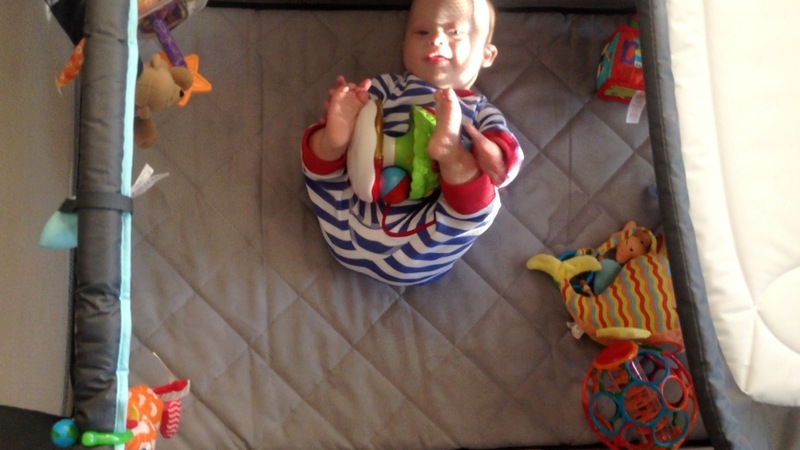 Noah has figured out that by using his very flexible lower extremities that he can get things that are out of reach. Pretty cute right? We thought so. His curiosity and exploration of his world continues to amaze us. He may not talk yet, but he is one smart cookie! Cognitive development starts when a child is born. Some very smart people with PhD’s and MD’s have done the research to see how we can monitor cognitive development from the very first few weeks of life. The very first sign is with a child’s eyes. Tracking is one of the very first milestones your baby will achieve. They will follow faces, followed by objects. We have talked previously about how we waited patiently, ok, maybe not so patiently for Noah to stare at us. Typical babies are able to do this almost at birth, where as children with Down syndrome it may take a few weeks. Don’t let low muscle tone get in the way of your little genius! Cognitive development often has to wait for the body to catch up with gross and fine motor skills. From gaining head control to look around, to being able to lift a hand to bat at an object or bring it to their mouth; attaining the strength to do these things limits further development. One of the important things in helping children with Down syndrome develop is to make adaptations so they can continue to explore and develop all of their needed skills. Take for example laying them on their sides to bat at objects so they don’t have to work against gravity. This is why early intervention is so important as all of development works together and delays in one area can filter into others. Catching your child putting their intelligence on display. The best part about today is that no one taught Noah how to do this, he just figured it out. 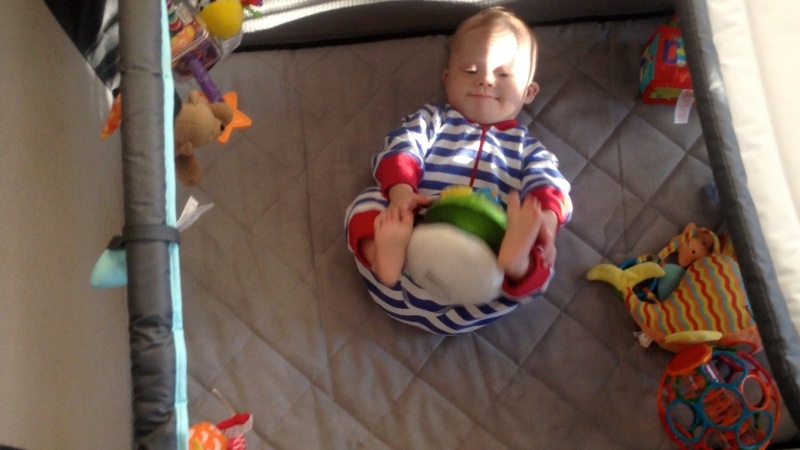 His goal was to get one of his favorite toys and once he figured out how to grab it with his feet when it was out of reach, he kept doing it over and over again. He's always aware that his parents are very proud of him! The definition of intelligence is the ability to learn, understand or deal with new situations. What ways have you observed your child showing off their intelligence lately? Please take a minute and leave a comment below telling us about it. I fear the day Noah figures this out. He is just starting to try to climb on things. Thankfully he doesn’t get too far yet. I LOVE this post! I work with people with developmental disabilities all the time, and I get tired of hearing others describe them in terms of what they “can’t” do. How do we know? When language and physical development are delayed, how do we know -what- a child knows? Hi guys, my daughter Grace is 20 months and surprises us everyday with different things! How she takes everything in and you can see her learning!!! She has a little wind mill that you hold and blow to make spin, she can’t blow it but she figured out if she flicks her wrist it will spin for her! She also figured out that she can only hold it at the end of the stick or the windmill will hit her hand and not work so if i hand it too her she will move position of her hand before she tries it!! Makes me smile everytime i see her do it!! Love the site guys!! This is so true my (step) nephew Collin was a 26 weeker and spent the first three months in the NICU having surgery and respitory issues. He could only army crawl and could not transition from laying to sitting etc. At about 14 months he came to our family when my brother remarried and I got to spend lots of time with him. His parents both worked nights and I days so when I got off they would be at my work to drop him off and then I would drop him at there work in the morning. We used every minute of his waking hours to work on his development. I could tell he was very smart he just couldnt figure out to do what he wanted so we worked on crawling, transition to sit and back, mouth closure, using his hemi side (helper hand), oral stim as he only wanted to eat oatmeal/pudding consistency, not W sitting, pulling up, walking around tables, to using rear walker for short time, then walking indepently, plus we did basic sign language so we got rid of the hollaring when he wanted something, He did all this from late April to September. He know is 5 and goes to school, he walks, talks, uses his helper hand automatically, and can run and he can jump getting both feet off the floor. He is awesome he collects the eggs from the chickens and figured out how to carry more than one egg at a time he began holding the bottom of his shirt and filled it with eggs. He is absolutley awesome and it shows that the dedication to these wonderful children is all they need. My Andrew is 7, and has Down Syndrome and Autism. He is non-verbal but has ALWAYS been an excellent problem-solver. I remember when he was about 15 months old, he figured out how to climb onto the chair (and soon after, the bookcases…). He used to roll over to the chair, throw his bottle into the seat, and then climb up. He was showing better planning skills than his big brothers!! At 18 mos, his ST told us to encourage speech by putting his favorite toys in a clear plastic bin so he’d have to find a way to request the toys. Well, within 20 minutes, he figured out how to pop the lid off–by pushing the bin against the china cabinet, flipping it on its side, climbing up and bouncing til the lid popped. Once he did it, he could do it again and again. Nowadays, he’s able to unbuckle his car seat and does so whenever the car stops, even at a red light. We’re working on that and he’s learning quickly. He can climb anywhere. He one day climbed to get a bowl, put an intact can of ravioli in the bowl, put the bowl in the microwave and pushed a button (thankfully, not “start”). A few weeks ago (he’s 7 now), I decided to teach him to put away his own laundry. I figured, by summer’s end, maybe. But I just said “put them in”–he sorted and put them in the right drawers. Which made me feel so awful for under-estimating him. The autism part is hard because it just doesn’t occur to him to let us know what he can do. With his IQ test, he didn’t participate in many things that I knew he could do in his sleep…he’s just not motivated to please the tester by answering her questions. She said he’s clearly a ton smarter than he tests, though. We’re from central Oregon. It’s high desert, so not the Oregon most people picture, drier with more tumbleweeds. 🙂 we’re from CA originally, but have been pretty settled here for a couple years now. Warren had his last day of kindergarten yesterday! I can’t believe he’s on the way to first grade! Wow, kindergarten. 🙁 Noah’s about to start a preschool, and we get sad just thinking about him being gone all day, but we also know he’ll have a blast meeting new friends. How did Warren like Kindergarten? Do you guys have anything fun planned for the summer? Warren really enjoyed kindergarten, we’ll see what he thinks of school once it’s a full day. (here kindergarten is only half day) Much to the consternation of his teachers he refuses to eat at school, so that could get interesting. No huge plans this summer. He’s been doing therapeutic horse riding since January which we hope to keep doing, and possibly thinking about swim lessons again. Is Noah planning anything fun? You know, Noah is a huge fan of the pool so I think we’ll be heading out to the pool for some summer fun. Noah’s about to start an all day program in August…it’s bitter sweet. My son, Max, is 18 months old. The other day I stepped out of the room momentarily. After just a couple of minutes I noticed the living room get very quite. I discovered Max watching his favorite DVD. He had figured out how to turn on the Blu-ray player all by himself! By the way, what’s his favorite DVD? We’ve put all Warren’s movies in a CD wallet so we can put them up and away. He gets up first, and if he can he’ll get up at 5am and set up a movie. He’s super into Pixar movies, the incredibles has been big lately. Rio is another favorite. As much as I hate to admit it, he LOVES mamma mia. The way I con him into wearing his glasses in the car is requiring them before I put on the soundtrack. We listen to it everywhere we go. For over a year, my precocious little Ellie has taken to pushing boxes, stools, books, etc to babygates/dressers/counters and then climbing on top of them to reach objects that are a no-no. The latest involved her quest for vaseline. She opening all of her dresser drawers and used them as stairs to reach the vaseline on top of the dresser. Then,she fingered out how to open the jar of vaseline (and coat it everywhere!). I absolutely love your child, she cracks me up. I am sure you don’t find all of her antics as funny as we do 🙂 I hope one day these two can get into some trouble together. Today Judah (same age as Noah) made the sign for “banana” when he saw a picture of one before I even said the word aloud! I was so surprised and proud of him! Noah just learned banana too! Are you doing flash cards? Little Man (19 months, “normal” except for his metabolic disorder – VLCADD) started demonstrating his ability to get what he *really* wanted from the time he could crawl. We have a puppy that is gated in the kitchen with a baby gate. Little Man would throw a toy over the gate to the dog, knowing that the dog would chew on it so I’d have to get up and take it away form the puppy. In the meantime, he’d crawl (now he runs) his little bum over to the couch to get what he *really* wanted (which was usually the TV remote or Mama’s phone or Mama’s laptop). Thankfully, the puppy doesn’t chew as much on things that don’t belong to him so I don’t have to run to get things away from him. Also, he started pushing his chair to the wall by the light switches so he could reach them better (he’s been able to reach them for awhile but now he stands on his chair to reach them better). What a cutie! Unfortunately our dogs love to chew Noah’s toys and he loves to chuck them over his play yard to them. We have lost so many of his toys. I bet she is the cutest dancer ever! Our son is 14 and a boy scout in a typical troop. On his first campout we were on a long hike and came upon a huge fallen tree. The other scouts had never heard him talk much, and when he saw the tree, he put his hands on his hips, stepped back, and said, “That’s ridiculous!”. On that same hike, my son, who NEVER runs, ran ahead of the whole troop, turned around and said, “Run, run, as fast as you can! You can’t catch me, I’m the gingerbread man!” Not sure about other kids with ds, but whenever it’s cold outside, our son always seems more alert and engaged. Just remembered another antic 🙂 Aidan loves potato chips (crisps), yesterday at the supermarket I said he could have a bag as a reward for being a great lad at the optometrist. No sooner did he get the bag in his hand he raced to the self checkout, attempted to scan the barcode and then proceeded to pack them in a grocery bag!!! (much to the delight of a couple of bystanders). That’s funny! Aidan sounds like a super cool little boy! I can’t even begin to imagine all the ‘trouble’ Noah’s going to get into when he’s 4! Be sure to keep us posted on your journey, we enjoy hearing stories like these. Our 3 1/2 year old Jillian has been using ASL as a way to communicate for a few years now. She was 2, sitting in her highchair eating lunch when she wanted something different. Her verbal skills were and still are a bit delayed but she knew how to get her ideas across. This is how our conversation went. Mommy: Jillie, are you all done or do you still want to eat? Mommy: What would you like to eat? Mommy: Socks? You want to eat socks? Jillie: (still signing) Yes, socks. Mommy: (speaking and signing) Do you want APPLE SOCKS? Jillie: (in ASL) Yes, APPLE SOCKS. It took me a few but I realized that our daughter was problem solving. She didn’t know the sign for SAUCE but figured out SOCKS sounds a lot like it and substituted the word in hopes her mommy would be astute enough to figure it out. ha,ha..that’s awesome. You guys sound like great parents! Noah’s learning ASL right now, and has a few signs down. It’s super cute to watch him do them. We are using Baby Signing Times, did you use that program to learn, or something else? How many signs does she have now? Signing Time is awesome! Paul has apraxia so speech is his main difficulty. Some days he talks very clearly, other days it’s just vowel sounds. Some days it’s a lot, other days it’s only a few words. We didn’t sign very much with him when he was younger because of conflicting information (which we regret) but he picks up signs quite rapidly with the help of Rachel, Leah, Alex & Hopkins. He loves to sing along with the songs too. The current favorite is Helping Around the House. Hi again!.Nia discovered last week how to turn the T V on not by using the remote. When I told my son he did not believe me. She does watch us point the remote towards the T V and then she does the same as well. I came across this blog earlier today while seeking some information and parenting advice. I am also an active Mom and a true believe in the power of love that families can provide for one another. Your blog is truly inspirational, informative, and entertaining. Noah is such a fun little guy with clearly awesome parents. Thank you for sharing your every day moments with him, and parenting insights. I agree with the sub-text of your message, and that is to appreciate what life brings every day. There are always lessons to learn and fun to be had. I write about the importance of engaging with kid’s while getting the “every day” stuff done in my blog: http://forevertogetherfamily.blogspot.com/ if you are interested. Thank you again and I look forward to more updates about your little Noah! Thanks so much for the kind words, and for sharing your blog! My son Jonah, who is 18 months, has really exploded with new tricks within the past 2 months! He’s started cruising down the couch, and trying to stand on his own (we count the seconds until he falls (:). He has learned to put things in containers (other than just dumping things out), and blow kisses! We are having so much fun cheering him on, partly because his reaction is so funny when we do, and also because nothing else compares to him accomplishing the things he is working so hard for! Thank you so much for writting your blogs! Your son is gorgeous! Thanks so much for your comment. Jonah (I like that name) sounds like an awesome little dude! When was he born if you don’t mind me asking? Noah was born on Dec 15, so they are the same age. He also is blowing kisses and waving good bye…and I can’t get enough of it. Sometimes I pretend to leave the house, just so I can see him wave his cute little hand. So I know just what you mean. Does Jonah have any brothers or sisters? I am a very proud Grandma of Matai, who has DS and is nearly 9 mths. Don’t know whether it is regarded as problem solving but when he is sitting, if you place your hand in front of him and say “High Five’ he will slowly raise his closest hand and place it on yours. I have also seen him doing it when his Mum placed both of her hands out in front, said the all important “High Five” and he slowly raised both oh his hands to hers. Pretty cool. Thanks so much for sharing about your grandson. You sound like a great grandmother! Noah is doing the same thing with the high five..it’s so cute, and I could watch him do it all day. Are you guys (and Matai’s parents) part of our Facebook page? (http://facebook.com/noahsdadcom) We have almost 16 thousand parents on there and it’s fun to see all of their pictures, and learn about their stories as well. Feel free to post a picture of your family on there, we all enjoy pictures. By the way, where are you guys from? He heard Dad mention that the cars needed to be washed and went right upstairs, put on his bathing suit and brought down the bucket from the cleaning closet. Needless to say, cars got washed right then! My grandson Ryan is now 4 but has been connecting things from a very early age. His parent’s like yourselves had no idea that their child had Down’s Syndrome. They lived in the North East of England and we live on the South Coast of England. On Ryan;second visit to us he realised the ceiling fan was not on. He was approx 5 months old and made noises and kept looking at the fan until my husband put it on. Once it was on he was happy and stopped making noises. The next time he came to our home he was eight and a half months old. He again looked at the fan and started making the same noise he had before, my husband said what do you want and he turned his head and looked at the light switch which controlled the light and fan and again he was happy once it was put on. Just before his 2nd birthday we sold our house and moved to the North East where he lived. We had to downsize as I have mobility problems and my husband had had a stroke but is pretty much back to normal. My son said why not downsize to Whitley Bay where they live as he knew we liked the area. Ryan was brought to our flat the day after we moved in and immediately looked at the light, there was no fan and he kept pointing at it. Two weeks later we had the electricians in as there was a lot of electrical work to be done and we asked them if they would put the ceiling fans in first which they did. The next time Ryan came to the flat he looked up saw the fans and clapped. He has been in a Special Needs Nursery School since last September 3 days a week and his report came home with him last friday. It is very encouraging as it says he can apply himself to maths, gets engrossed in music so he goes to music lessons and that he has the ability to solve problems. He has very little speech but signs well and in his report it stated he only has to be shown a sign once and he remembers it and he communicates this way when in Nursery School. He goes into the Reception Class full time next September so we are all really pleased with how he has come on. From birth he was laid across his parents knees which encouraged him to lift his head to see their faces and his neck muscles strengthened by doing it. It was a tip we were told by my niece who is a Physiotherapist with a Masters in Cerebral Palsy and Down’s Syndrome. He is a very happy child and he started walking a year ago as his muscle tone was very poor when he was born and on my side of the family we have loose ligaments but my son persevered standing him up and waiting for him to balance and then would let go and he would try to walk to one of us. He soon got the hang of it and now has to get his speech as he does not say many words and also he is still in nappies although they are trying to get him potty trained. It will happen when he is ready and having 3 other grandsons I find helping Ryan to learn things is more rewarding than helping the other 3. He has had to have his tonsils out and most of the time the Down’s Syndrome facial features are not really noticeable. You only see his tongue if he is tired or if he pokes it out at you which he has been taught to do by his older cousins. I have read about Noah’s Penguin Party but for some reason the Pictures have not shown on either the email or the website so it must be my laptop. I think that what you are doing by making this blog will help many parent’s of Down’s Syndrome Children as not all have someone they can turn to whereas we were lucky as My Brother is a retired Consultant and his one daughter is a GP and another is a physiotherapist so if my son was unsure of anything he just rang them.. I read your blog regularly since I came across it on Facebook. Thank you for doing it and I expect a lot of other parents and grandparents are interested to.